Who are PH Companies Eyeing to Launch the Countryâ€™s Third Telco Player? Until late last year, a third telecommunications company player to compete with the so-called duopoly of PLDT and Globe Telecom seemed like wishful thinking, even if President Rodrigo Duterte set a March 2018 deadline for the new telco to be up and about. But that changed this month when the Department of Information and Communications Technology (DICT) released a memorandum circular detailing the draft regulations on the qualifications and selection of the new major player (NMP) in the telecommunications industry on February 19. The circular also defined the key criteria for choosing the third telco player, which is the highest investment commitment in the next five years and value of existing telecommunications facilities in the Philippines. Of course, the bidders must first meet the qualification requirements such as technical capacity, capitalization of at least Php10 billion, at least 60 percent Filipino ownership and debt of not more than 30 percent of long-term capital. It set the date for the submission of bids on May 19. However, after a public consultation on February 28, the DICT has indicated it may change some of the rules. Instead of highest committed investment, the bidding criteria will be the highest committed service performance. It may scrap the Php10-billion minimum capitalization criteria in favor of a higher performance bond. The deadline for submission of bids has also been moved towards end-May. While the DICT has yet to officially start the process of qualifying potential third telco players, various news reports have mentioned at least five possible contenders. These are NOW Corp., Philippine Telegraph and Telephone Co. (PT&T), Converge ICT Solutions Inc., EasyCall Communications Philippines Inc. (ECP) and Transpacific Broadband Group International Inc. (TBGI). Many are said to be in talks with foreign partners on the forming of a telecommunications company that will bid for designation as the NMP. Important corporate and financial information on each of the companies are summarized in the infographic above. 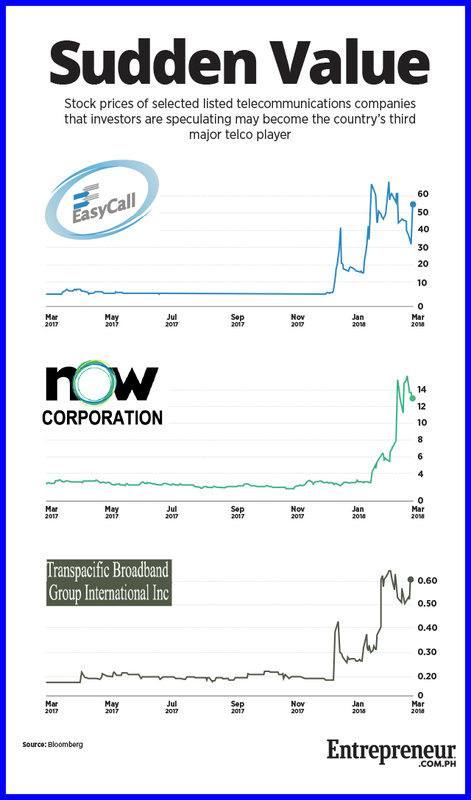 NOW Corp., a listed technology company, recently made headlines for having renewed the legislative franchise of its subsidiary, NOW Telecom Co., until 2043. It is chaired by Thomas Aquino, former senior undersecretary of the Department of Trade and Industry. Several of its biggest shareholders are companies under the Velarde Group, which is headed by NOW President and CEO Mel Velarde. Some of the brands that the company owns are "NowPlanet.TV," a social business platform to help enterprises manage their marketing and communications campaigns across multiple mobile devices, and "WebsiteExpress.Biz," a one-stop shop website development service. Its subsidiaries include J-Span IT Services, Inc.; Porteon SEA, Inc.; I-Resource Consulting International, Inc.; I-Professional Search Network, Inc.; and Softrigger Interactive, Inc.
Once a major player in the local paging industry, EasyCall Communications Philippines now operates an IT outsourcing business serving clients in the U.S. It also offers various web-based solutions such as domain hosting, website development and other internet services. ECP is headed by Jose Roberto Delgado, who sits on the board of various technology, transportation and logistics companies under Transnational Diversified Group, and Modesto Cervantes, who also heads machinery business Bormaheco Inc.
Transpacific Broadband Group International operates several facilities in the Clark Economic Freeport Zone, where it is able to distribute local and foreign television channels. TGBI also provides internet services to select clients, which consist mostly of schools but also includes private companies and government agencies. NOW, ECP and TGBI have all experienced a surge in their stock price values as a result of market speculation on which local company will become the third telco, according to a February 27 report by Bloomberg. (See infographic below). Aside from the three listed companies above, two other names have been frequently mentioned in news reports as possible bidders for the third telco franchise. One of these is PT&T, a major telegraphic service provider when it was established in 1962. It later evolved into a diversified telecommunications company but was set back by the Asian Financial Crisis in 1997. It is still listed in the Philippine Stock Exchange (PSE), but it voluntarily suspended the trading of its shares back in 2004. Last year, majority ownership of the company was bought out by private investment firm Menlo Capital Corp., which is owned by Salvador Zamora II, former president of listed mining company Nickel Asia, and Benjamin Bitanga, founder of listed property company MRC Allied Inc. The second is Converge ICT Solutions, a Pampanga-based information technology company founded by businessman Dennis Anthony Uy (not to be confused with Davao-based Phoenix Petroleum founder Dennis Uy). It is one of the major subsidiaries of ComClark Network and Technology Corp., which also operates a cable television firm. Converge ICT was granted a 25-year legislative franchise to operate as a telco in 2009.